Can your website be your API? Drew McLellan Web Standards Group Microformats, UOW, DECSE Hello! also work at Yahoo! I’m not speaking for Yahoo! today. 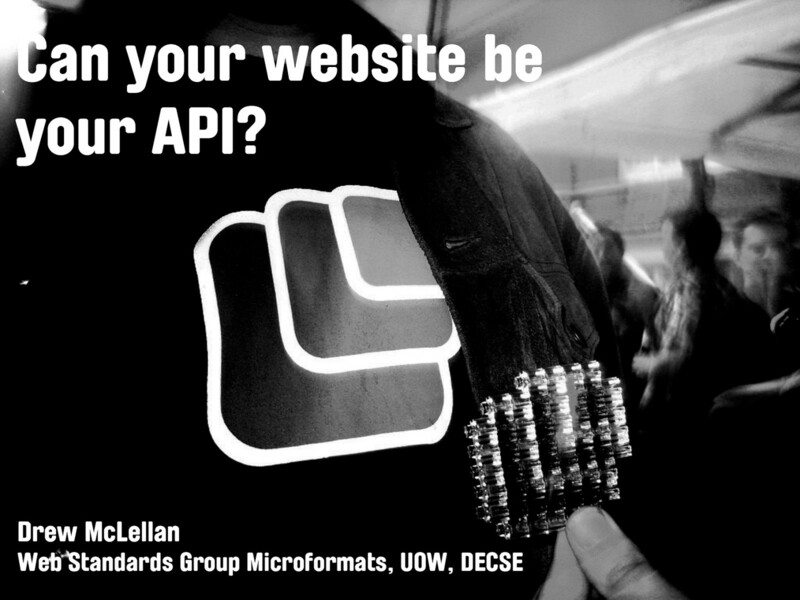 Can your website be your API? Can your website be your API? No No but yeah, but no, but yeah. Brain > Code We've been hearing a lot about microformats and how they enable us to mark up data in a meaningful way. We do this so that the information becomes useful not just to complex parsers - like the human brain - but to relatively simple parsers, such as software. Software, of course is derived from a very small subset of the human brain, and therefore can't currently encompass the extreme complexity of the rules and processes the human brain goes through when trying to make sense of something such as an arbitrary list of random words. Spotting a likely name in a list of random words for example, is quite easy for us but more far more complex to identify all those rules and codify them. Fork handles? An interesting example of such a situation is with telephone technologies, and in particular speech recognition. There have been all sorts of e ! orts in the past to get speech recognition working well across phone systems. I imagine most of us have at some point played around with speech recognition software of some kind. Maybe that's PC dictation software, or maybe just an annoying IVR system. They don't tend to be so great at recognising anything but the most straightforward patterns of speech. The human brain, as a complex parser, takes very little time to adjust to di ! erent voices - even the thickest of accents are typically understandable within a few moments of listening to a person's voice. Speech recognition software - until very very recently - has found it hard to get any kind of acceptable accuracy levels even with RP. Mix in the poor audio quality of a phone signal, and this becomes an even tougher task. File > Open A few years back I was at college with a guy who'd been helping his housemate install and conﬁgure some speech recognition software on his housemate's PC. My friend spent quite a bit of time ﬁne tuning the program whilst his housemate was out at lectures and managed to get it working with a pretty good level of accuracy. So you can imagine my friend's surprise when his housemate reported that he was getting absolutely nowhere with the software, despite persistent e ! orts. So my friend tried it himself "File, Open" and it worked just ﬁne. The housemate tried again "File, Open" and nothing happened. Thinking for a brief moment the housemate tried again in my friends Geordie accent, and lo and behold, it worked. ( shameless ) So whilst it's usually possible to get close to the meaning of things by having a machine attempt to process the material the human brain works with directly, it's often far more e ! ective, e " cient and reliable to provide dedicated information that a machine can understand. For telephone systems, this resulted in the fax machine. A fax machine works by turning data signals into audio signals which can be sent over a regular audio phone line and turned back into data by the fax machine at the other end. Rather than trying to have machines understand a human voice, the machines only need to understand other machines, over the same type of line. beep Fax machines are the APIs of the telephone world. They're a provision for machine to machine communication in and out of your company or organisation. This has big beneﬁts, as larger amounts of data can be transferred much quicker and with greater accuracy than if there was a manual process involved. Tel: +44 (0) 1234 432 432 Fax: +44 (0) 1234 432 433 They're not without their downsides though. Fax machines are hateful, evil machines that will eat your soul and then spit it out as an ad for a cheap car purchase plan. Once a company decides to have a fax machine and enable customers to communicate with them via fax, the company has to start publishing a di ! erent phone number for faxes. This means that customers then have to go through the extra cognitive step of ﬁguring out which damn number to call. Doesn't sound like a particularly heavy cognitive process, does it? Or so you'd think unless you've ever had a desk in an o " ce where you're sat near the incoming fax machine. Mmm APIs! But this is not a argument against APIs - far from it. An API is increasingly an essential component for any modern web application. This is an argument to provide that same functionality in a more e " cient way. An argument to reuse existing technology and resources in place of building new and spending more. This an argument to make your public facing website your API, and to do so through intelligent use of HTML-embedded data mechanisms like microformats. Bow-wow Imagine for a moment that fax machines could operate at the sort of high pitches that dog whistles create. Whilst the screeches and beeps would be inaudible to the human ear, another fax machine could be tuned to pick them up. The result being that the audio band to which the human ear is sensitive would remain clear, enabling a normal conversation to take place at the same time on the same line. You could make a reservation AND conﬁrm it in writing during the space of the same phone call. Of course that's pretty daft, not least because a phone line doesn't have enough ﬁdelity to achieve that - it can only just cope with the human voice. A web page is similar. It has higher ﬁdelity than a phone line, as we can include both the human-readable information and basic semantics for machines. That ﬁdelity can be vastly increased, however by adding microformats to the markup. All of a sudden the information we're communicating for humans can be encoded to be understandable - in detail - by machines. yay. This means that the same page that serves data to your human visitors can serve data to your robotic friends too. What's more, it's the exact same data representation, and not a secondary view into it to develop and maintain. Of course I'm talking about how this can be achieved with microformats, but how does this work in practise? Let's take an example from your favourite social events aggregator and mine, Upcoming.org. Let's take a simple example of the detail page for an event - like today's WSG meeting. If you look at the URI of the page, it tells us a lot of information. http://upcoming.org/ event/105545 We have the domain name - upcoming.org - followed by the type of object we're asking for - an event - followed by the unique identiﬁer for that event. The corresponding API call for the Upcoming.org API is event.getInfo. &method= event.getInfo &event_id=105545 Noticing any parallels? What we have here is essentially the same data request formatted in two di ! erent ways, and resulting in two di ! erent representations of the same data. The people of the internets call this a waste. So what if the same resource could be accessed and understood by both regular visitors and machines... One URL, accessing One resource, readable by BOTH types of visitor. Of course, our friends at Upcoming.org are friendly web citizens as well as smart, and have already added the hCalendar microformat to this page. <div id="event" class=" vevent "> <h1 class="name summary "> WSG Meetup: Microformats </h1> <div id="eventMain"> <div id="eventMetadata"> <div class="small">When</div> <div class="date"> <abbr class=" dtstart " title=" 2006-10-19T18:30-07:00 "> Thursday, October 19, 2006</abbr> </div> <!-- /.date --> <div class="time">6:30 PM - 11:00 PM </div> <div class="venue location vcard "> <br /><div class="small">Where</div> <span class=" fn org "><a href="/venue/33942">New Cavendish Street campus of Westminster University</a></span><br /> <div class="address adr "> <span class=" street-address ">115 New Cavendish Street</span><br /> <span class=" locality ">London</span>, <span If we look at the source, we can see various familiar class names and code fragments that give us all the clues we need to identify an hCalendar event. ‘Tails’ for Firefox If we run this page through a microformats parser like Tails for Firefox, we can see it ﬁnds the data. Similarly, X2V will happily convert this page into an iCal ﬁle. If I'd written the hCalendar module for hKit yet, I'd be able to show you that too. It's in the lower-level parsers (the sort that talk between a page and the code you write rather than the page and a user) that the really useful power lies. <?xml version="1.0" encoding="UTF-8"?> <rsp stat="ok" version="1.0"> <event id="105545"
tags="microformats, web standards group, standards"
description ="This month is the WSG meetup is going to be all about Microformats and we have three speakers... <snip /> "
date_posted="2006-09-07" latitude ="" longitude =""
geocoding_precision="" geocoding_ambiguous="" /> </rsp> Comparing that to the output of the event.getInfo API call, we can see that we've successfully extracted pretty much the same data. This renders event.getInfo redundant. event.getInfo event.getInfo is no longer needed, as the same data can be extracted from the page directly. So that's just a very simple example. Unless you've been asleep during every Web 2.0 presentation for the last year, you'll be aware that Flickr has a very powerful and complete API. Surely nothing we can do with microformats could touch the power and might of the Flickr API? http://flickr.com/ people/drewm Just like our example from Upcoming.org, we have the name of the service - ﬂickr.com - the type of object we'd like to retrieve - a person - and the unique identiﬁer for the person in question - the username. flickr.people.getInfo The equivalent request from the Flickr API is ﬂickr.people.getInfo. &user_id=87703047@N00 Except you'll notice that the user_id I've provider here isn't my username. That's because behind every friendly user identiﬁer in the application, Flickr has a nasty numerical identiﬁer which is guaranteed to be unique. flickr.people.findByUsername Therefore, before I can make a call to ﬂickr.people.getInfo, I need to ﬁnd the user_id by the way of a call to ﬂickr.people.ﬁndByUsername.
) hKit and hKit ﬁnds it too. flickr.people.getInfo Every user has a proﬁle page, so this renders ﬂickr.people.getInfo redundant. So since we're working our way through Yahoo's family of Web 2.0 poster children, let's do the same with del.icio.us. The URI of my page listing bookmarks for the tag 'microformats' takes a slightly di ! erent, simpler form this time. http://del.icio.us/ drewm/microformats We have the service name - del.icio.us - as the service deals with bookmarks way more than anything else, that's the default item for retrieval, so we go right in with my username - drewm - and then the identiﬁer for the data we want - which in this case is the tag 'microformats'. The good news is that Ma.gnolia does! So here's the same query from there. Tails Here it is in Tails, using the xFolk microformat. hKit has preliminary support for this too. Similarly, say I wanted to get reviews for a particular wine from corkd.com. o_O ... well, corkd has no separate API. Fortunately, corkd is rich in microformats, including hReview. Running a parser over the wine detail page gives us all the data we need. Even without a formal API. Hah! But that's the beauty of it! Something I'm calling “ oblivious development ”. I've always looked at microformats as “ planting seeds ” that later grow into things you never even thought of. This is a key di ! erence between publishing an API and letting your data just speak for itself. When designing an API, you have to consider what data users might need, and to an extent how they’re going to use it. Those decisions have already been made for your website as part of your information architecture, and that data is already being published. The only e ! ort involved is in more careful choice of markup when building the page. read/write Of course, there’s more to APIs than just retrieving data. Whilst reads are the VAST majority of the tra " c to most common APIs, a lot of the concept, at least, is about writing data back too. Fortunately, that’s the easy part of the problem too. Sending data to a service is already in a structured format, as is already in a format speciﬁed by the provider. An HTTP POST is already works in this way by its nature. If we were to extend the idea, we could specify a common format for POSTing events or contact details, and indeed there’s already work happening on that within the microformats community. Cook’d? So is what I’m suggesting ready for the prime time? Can you forget about building an API and rely on good semantics to get you through? For reads, yes, absolutely. Cork’d are doing it today. If you need to have a fully read/write environment, possibly not quite yet. It’s no but yeah but no. http://allinthehead.com/ about In fact, this already exists. Because I already publish things about myself on my own site, by using microformats, there’s an API for me. Can I add enough semantic information to the pages I already publish so that they could replace the function of a dedicated API? Can I add enough semantic information to the pages I already publish so that I get an API thrown in for free? Hell yeah. If you're a data publisher, all you need to do is put into practise some of the things Norm and Jeremy have been demonstrating tonight. Marking up your content with microformats is no only a good place to start, but the BEST place to start. View Can Your Website Be Your API? on Notist. The Web Standards Group London held a special evening with talks about microformats. In this presentation, I asked if the HTML of your website could take the place of a dedicated API to enable others to access your data.